Thanks to the US military, Republicans who refused to cut and run, and President George W. Bush, one stock market is setting new records today. 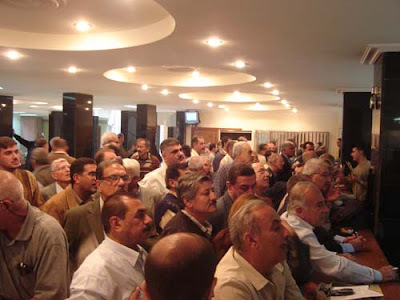 Investors hit the floor of the Iraqi Stock Market. The Iraqi Stock Exchange hit a record high today. Iraq’s Stock Exchange (ISX) index has risen dramatically by 8.390 percent to settle at a record high of 99.780 points during Sunday’s session, the first this week and the ninth this month. Traded shares in Sunday’s session exceeded 2.211 billion at a total value of over 2.736 billion Iraqi dinars (nearly $2.3 million) by implementing 331 contracts. Shares of 42 companies were traded in today’s session, of which 13 shares jumped, nine slumped, and 20 others maintained their previous levels. The banking sector achieved the highest trading volume with 91.7 percent. The Iraqi Stock Exchange, established under Law No. 74 of the year 2004, held its first session on June 24, 2004. Meanwhile… Back in America, democrats are taking the bullet train to bankruptcy.